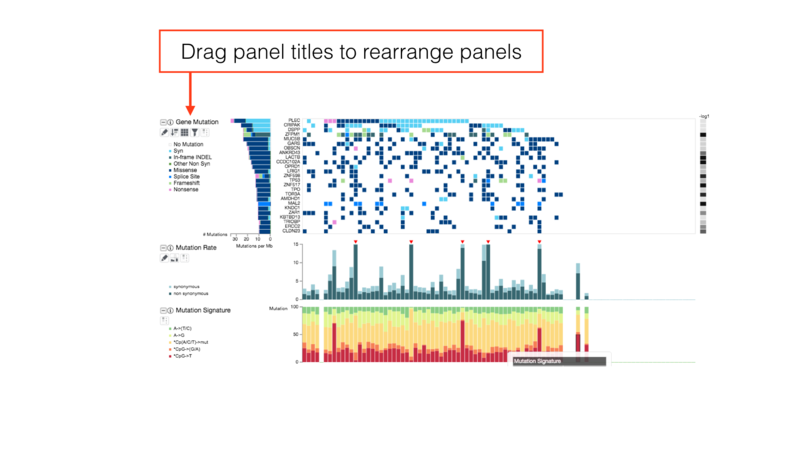 Comut plot, introduced by Nicolas Stransky, is often seen in cancer research publications as a visual summary of genetic variations/mutations in cancer cohorts. The plot itself is essentially an ensemble of multiple smaller and simpler plots (e.g. heat maps and bar graphs) aligned and interconnected via a common X or Y axis. iCoMut arranges patients along the horizontal X axis, with analyses and clinical parameters along the vertical Y axis. This form of grid-like graphical summary is particularly suitable for presenting data with an intricate and associative nature. iCoMut aims to further transform the static image into an interactive data exploring experience that is flexible and versatile, and through a web-enabled user interface, provides greater public access. Broad TCGA GDAC data and analyses summaries provided by Jaegil Kim, Hailei Zhang, Juok Cho, and David Heiman. iCoMut is developed by Katherine Huang, Sam Meier, Tim DeFreitas, Nome Shoresh, Eila Arich-Landkof, Michael Noble, Gad Getz at Broad Institute. 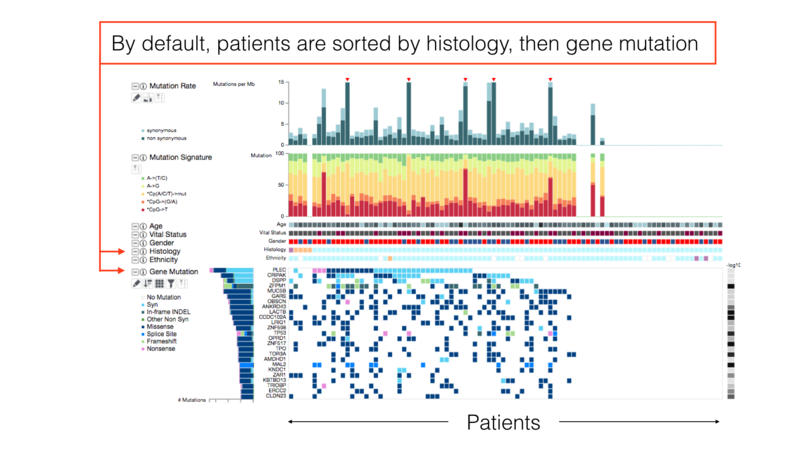 By default, patients in a cancer cohort are sorted first by the histological subtypes (if available), then by the gene mutations. 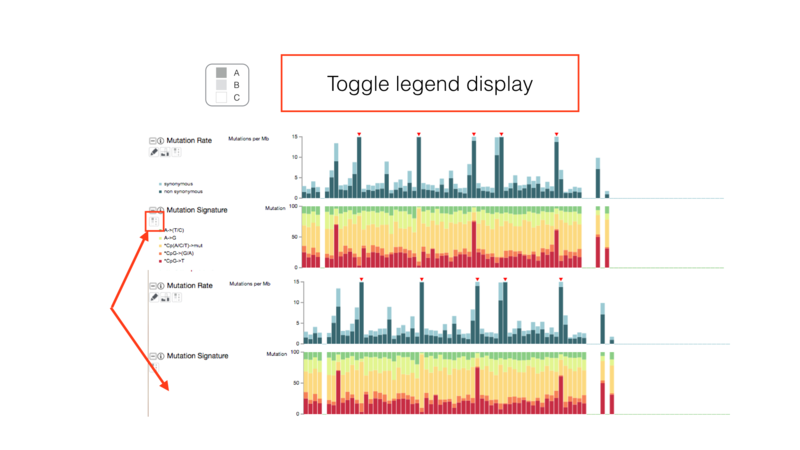 Data can be sorted by clicking on the text labels of the axes and the heat maps. To perform a multi-key sorting, alt-click on a text label to add a key. The info panel reports the sorting status of the patients and the box is draggable for adjusting its location on screen. The info panel will also show additional information about iCoMut data. 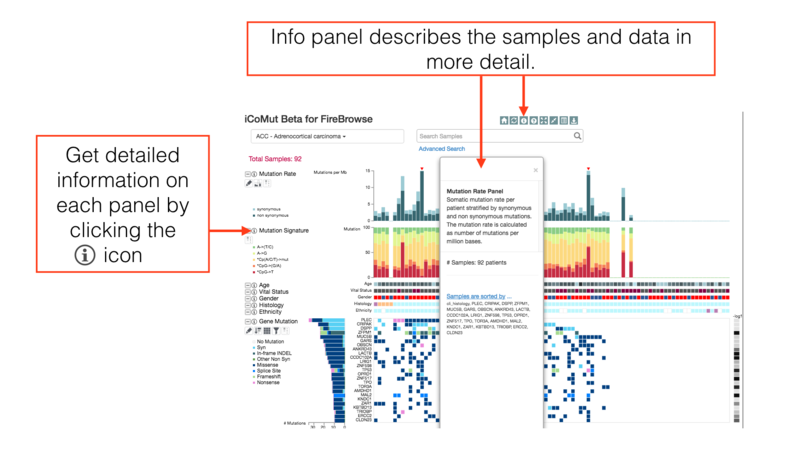 Panels can be hidden to make important insights more visible. 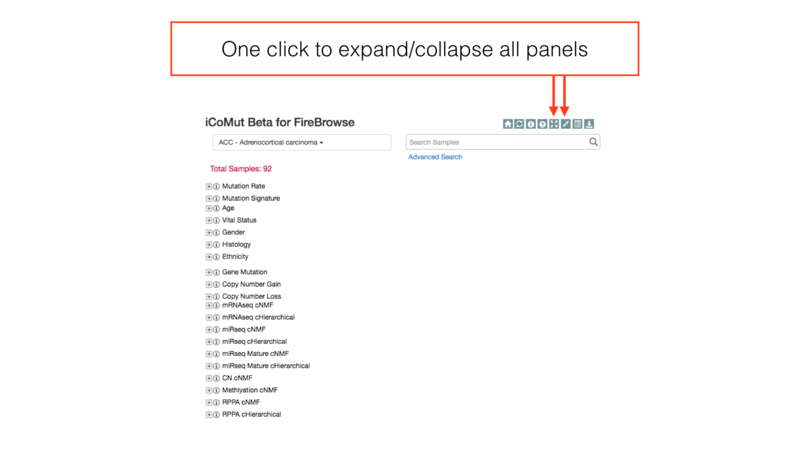 To more quickly expand and collapse all panels, use the buttons on the main iCoMut toolbar. 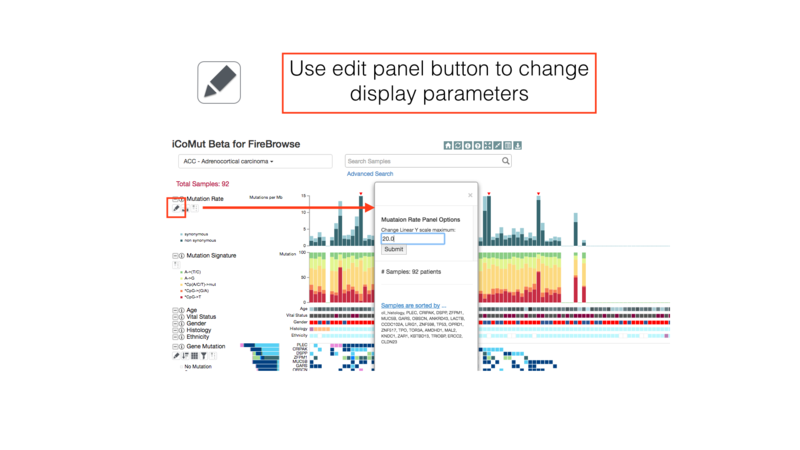 Some panels can have their display properties tweaked using the panel toolbar buttons. 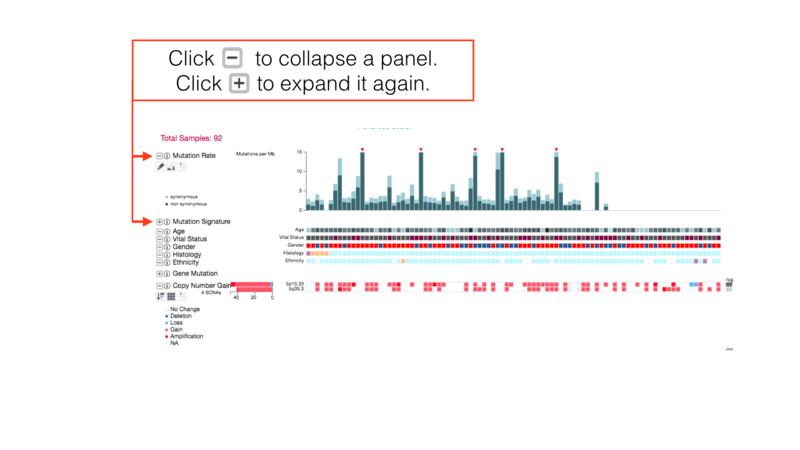 The edit button can be used to change the maximum Y value on the mutation rate panel. 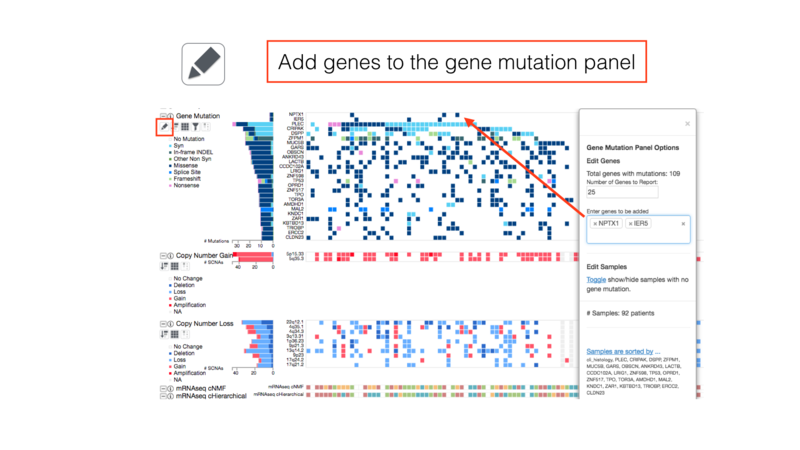 It also allows more genes to be added to the gene mutation panel. Use the clamp button to toggle outlier detection. 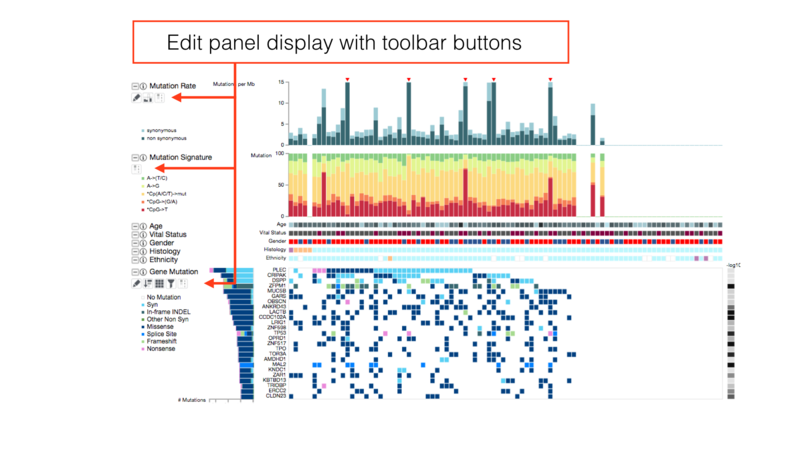 This helps view distributions with extreme outliers. Show or hide panel-specific legends. 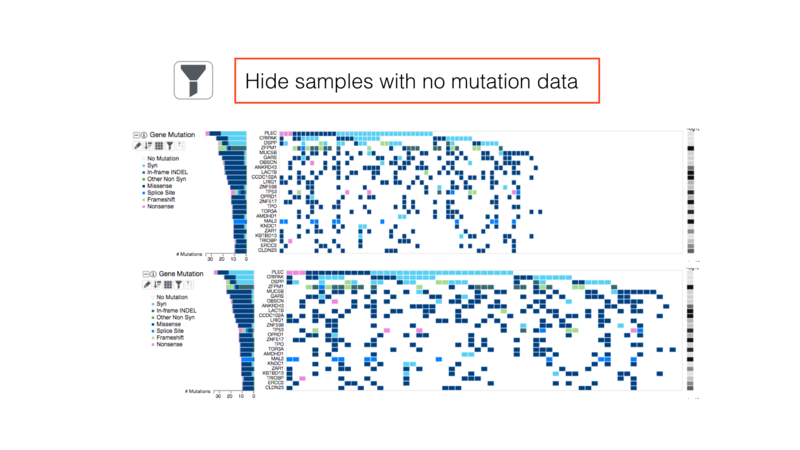 Filter out samples with no mutation information with the filter button. 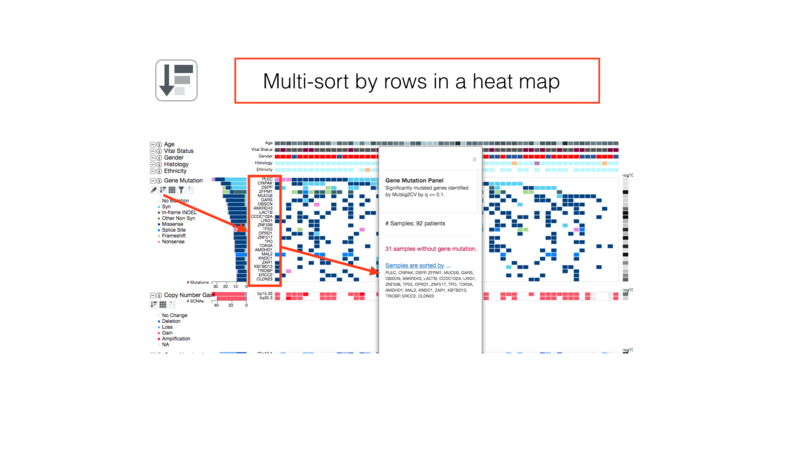 Multisort by all rows in a 2-dimensional heatmap. 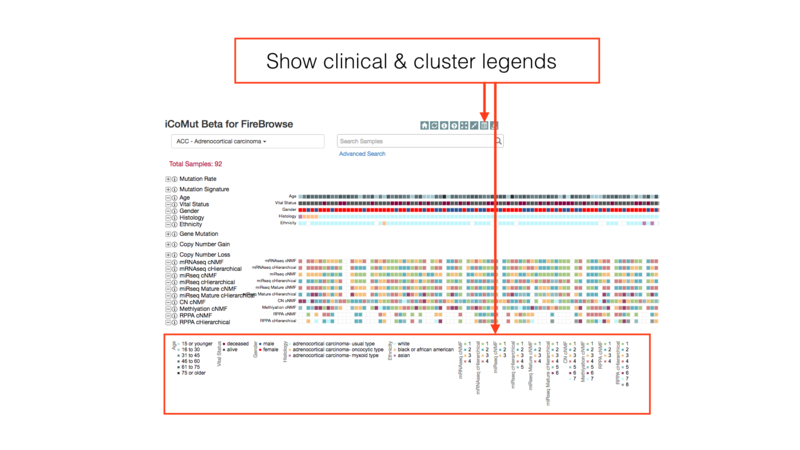 Show the clinical and cluster legends with the toggle hidden legends button in the main toolbar. 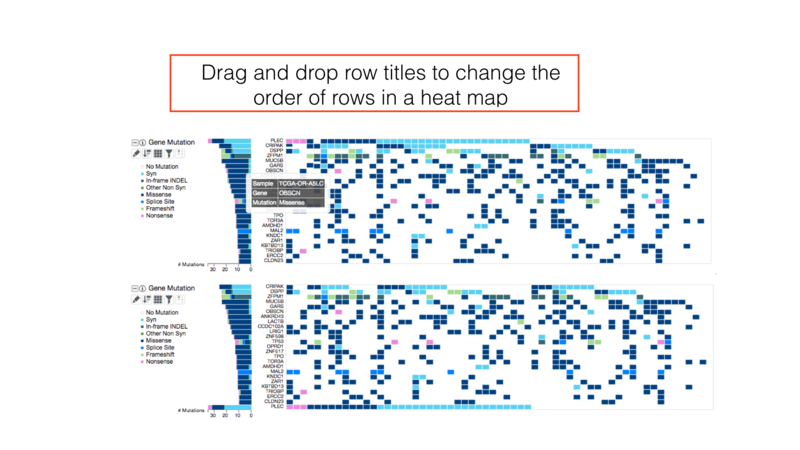 Drag row labels to change the display order of rows in a heatmap. 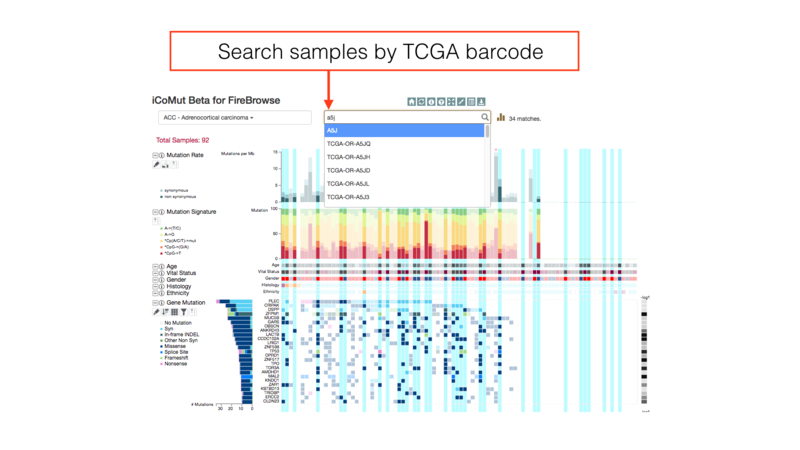 Use the sample search bar to highlight individual patients by TCGA barcode. Regular expression matching can be used to select multiple patients in a single search token. 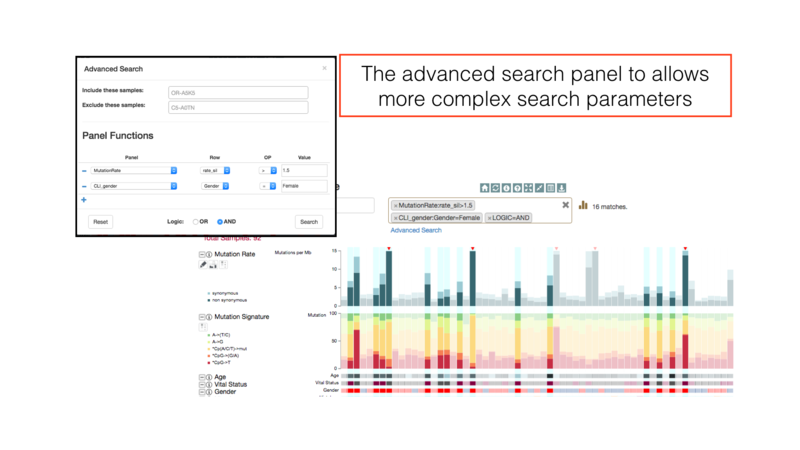 Use the advanced search panel to construct more complicated search criterion. In this example, the search returns all female patients with a synonymous mutation rate above 1.5. You can view a printable version of the figure by clicking on the 'Download Figure' icon in the main menu. 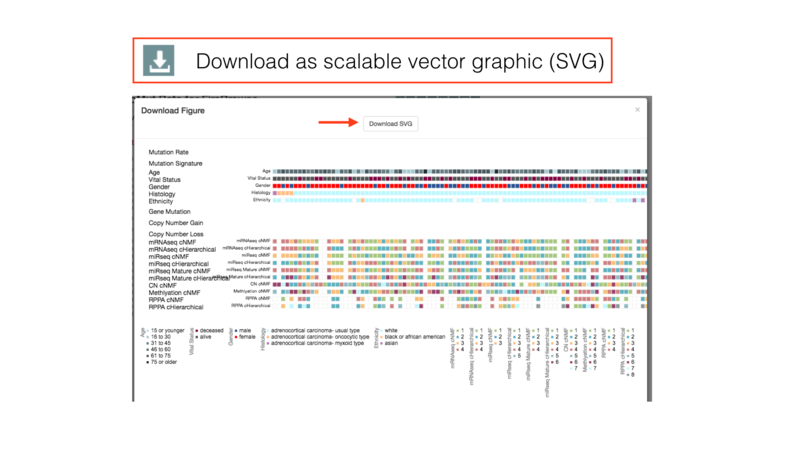 From the preview popup, you may download an SVG image of your generated figure, which contains an embedded link to a live version of the data. Somatic mutation rate per patient stratified by synonymous and non synonymous mutations. The mutation rate is calculated as number of mutations per million bases. Age is discretized into six bins of approximately equal range. 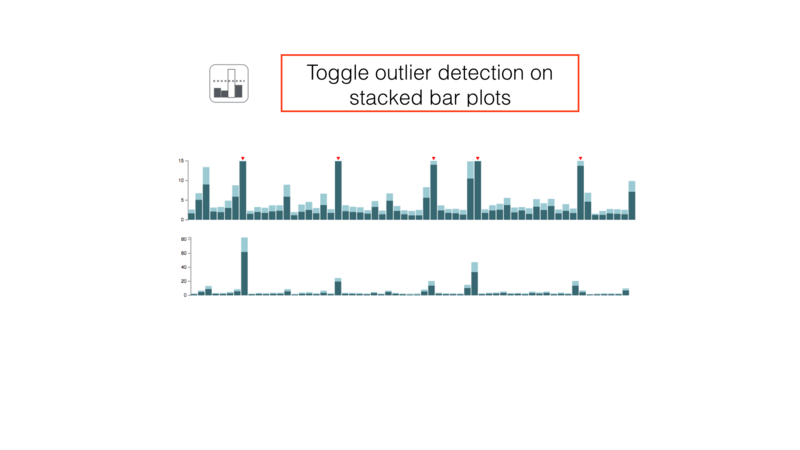 Significantly mutated genes identified by Mutsig2CV by q <= 0.1. 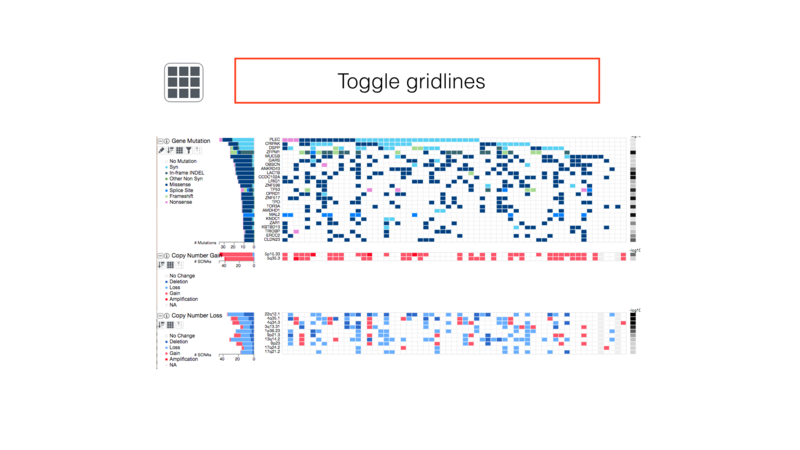 Toggle show/hide samples with no gene mutation. Focal Level Copy Number Gain Panel Somatic focal copy number gain events identified by GISTIC, color-coded by type of alterations (see color legend). Focal Level Copy Number Loss Panel Somatic focal copy number loss events identified by GISTIC, color-coded by type of alterations (see color legend).